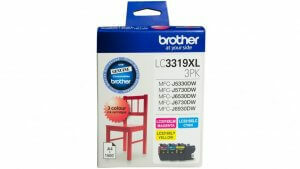 For instance, save money with genuine Brother LC-3319XL Ink Cartridge Value Packs. Each value pack contains 3 different high yield coloured cartridges for $133.00. Each pack contains 1x cyan, 1x magenta and 1x yellow ink cartridges capable of printing approximately 1,500 pages each based on 5% coverage.